How larger should be the roofing diameter that the pool diameter? When you open the roofing the folded canvas reches to the inner parts. We recommend a room around the pool edges min. 25 cm – ie. 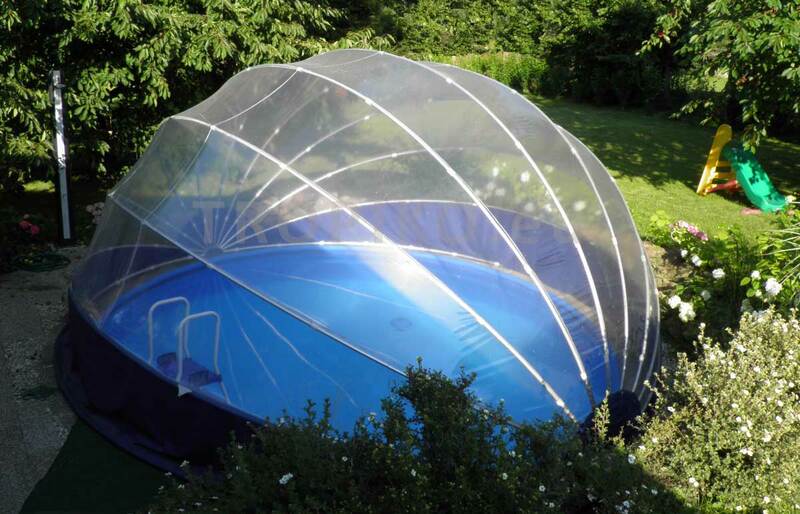 choose the roofing diameter by 50 cm bigger that the pool diameter. For above ground pools it is necessary to consider the room at the upper edge of the pool (not on the ground). Therefore we have prepared for you an auxiliary table of roofing dimensions according to the height and diameter of the pool. Always check if the roofing dimensions are not intervened by a skimmer or hose connections on the side of the pool, fixed stairs next to the pool or the height of their handrails. 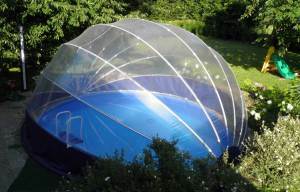 Is swimming pool water heated with roofing or is it necessary to use solar collectors? Yes, due to a transparent foil on the whole surface of TROPIKO roofing water is heated by a very hot air under the roofing. The blanket has no shielding elements. Pool water can be better heated when hot water on the surface of the pool mixes – with filtration on. If during summer months you want to have water temperature from 27 to 29 degrees you may use solar collectors as a supplement. Instead of the recommended size of the collector area, which is the same as the pool surface, half collector area should be sufficient. Do we have to change our habits in water treatment? To adjust the quality of water use only chemical products determined specifically for a swimming pool water treatment. 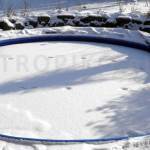 When using TROPIKO pool roofing the swimming season is significantly extended. At the same time the amount of dirt that gets into the pool (mainly by rain) is considerably reduced. Consumption of chemical products and costs to maintain quality of water are not overally increased, rather the opposite. During the period when pool water temperature rises above 28 degrees, observe water quality more often. Hot water spoils faster. Can we leave the roofing lay open next to the swimming pool in winter? Yes, roofing material can withstand exposure to weather conditions year-round. Before the frost it is necessary to open the roofing. The construction is not designed to bear additional snow load or glaze ice from the inner side of the roofing. How is the roofing wrapped for delivery? Everything needed to build the roofing is supplied in a cartoon and wrapped in a foil. 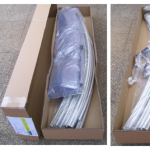 The product is delivered by the shipping service packed in a cardboard box of the size 210 cm x 50 cm x 25 cm, weight 35 – 55 kg according to the roofing size. Can we carry out installation ourselves? Installation (see instructions) is very simple. If you have successfully built and placed a free standing inflatable pool or assembled Scandinavian furniture be sure you can cope with installation of our roofing. Is it difficult to slightly open the roofing to enter the pool? Due to the balanced structure a child aged 5 years can open an unsecured roofing. We have several cats, can they claw the roofing foil? This of course cannot be excluded but the blanket is made of blue polyester fabric with water-repellent finish on both sides up to the height of the first rib. Can we fully open the roofing for unobstructed view while bathing? Full opened TROPIKO is a matter of course. Folded roofing next to the pool is 35 to 40 cm high. It opens on one side. Can the roofing be left outdoors in winter? If it remains closed on the pool can it withstand snow loads? Yes, the roofing can be left outdoors year round, but always open. Please note that when freezing the roofing cannot be handled, it could cause deterioration of the foil. Roofing is not designed to withstand snow loads. After several “weeks of snow“, it is necessary to open the roofing. The warranty on mechanical damage caused by snow load is not covered. I want to use your roofing on the pool located at the cottage where I do not live permanently. Is it possible to dismantle it for winter? Fixing and assembly of a covering blanket are easy for our product and the selected system also allows disassembly for storage in secured areas. Could hail pierce the foil? We have not encountered this problem. The foil we use is strong and flexible. Puncturing due to hail or rain is unlikely. In recent years none of our customers solved the problem with mechanical puncturing. If despite of this, there is mechanical rupture of the foil during your activities near the pool, we will help you with quality repair!